Our instructor was a guy by the name of Bobby Faithful. This guy has worked at a lot of well-know breweries including Dogfish Head, Lost Rhino Brewing Co. and The Answer Brewpub. I got the chance to talk to him after class, and this guy knows A TON of people in the local and regional beer scene. And while that might not be something that prospective students are prioritizing while looking for a beer brewers program, it absolutely should be. The craft beer scene is a tight-knit community. Having an instructor that can introduce you to professionals at a brewery that you’d like to work for one day cannot be overstated. We also discussed the difference between an ale and a lager, the difference between 2 row and 6 row barley, how to calculate the ABV of the beer, what amount of malts are typically used in a beer, using extracts versus whole grain, and the fermentability (generally) of different extracts. We don’t have class tomorrow, but the following week we get to brew our first beer. While we’re still at the beginning of the program, I think it’s a brilliant idea to be brewing so early, and before learning anything more than the basics. Have you ever worked on your car, or tried a recipe for dinner that you’ve never tried before? I have, and after I’ve finished, I’ve usually thought to myself, “that will go so much better next time now that I know what I’m doing.” The learning process [for me] is about doing, and then going back over the process and filling in the gaps with the knowledge that I gained the first time. I feel pretty confident that out first attempt at a beer [as a class] will go well. Most of us have brewed before, and Bobby will be walking us through this recipe (an imperial stout), but it will be invaluable to have an experience for all of us to draw on as a baseline for our future class discussions. So far, the pace of this program is exactly what it should be, keeping the seasoned brewers engaged while not going too fast for the novices. Week two we continued our study of craft beer history. Week one we studied the history of craft beer up until the American history of beer began. In week two we discussed history as it related to the [craft] beer movement in America. One of my favorite parts of this class was how the Ben Madden integrated the assignments that we were all given on a major influence in the world of craft beer. While he was going through the history chronologically, mentioning specific dates and events, the names of the influencers came up and each of us would find ourselves teaching the class for about 2 minutes on the individuals we were assigned. I’ve been in history classes where the teacher just read a list of facts and dates about historical figures and events and I was bored to tears. These past two weeks have been engaging and interesting. Maybe it’s because we were talking about beer; maybe it’s because there were so many small facts that I hadn’t connected to each other yet; maybe it’s because an instructor who was genuinely excited about what he was teaching was teaching us; but whatever the reason, this was honestly one of my favorite history classes I’ve ever taken. I enjoyed the classes so much, and the interesting stories of the brewers that we were learning about, that I found myself ordering many of the books that we were discussing during the break. (I cant’ wait for The Craft Beer Revolution by Steve Hindy to get here). The pace of the class was perfect. There was a lot of information, but it was never overwhelming. It was incredible to learn about how any why people were getting brewing and owning breweries, and what their background was prior to brewing beer. Prior to 1978, it was illegal to homebrew in the US and even illegal to write or own books about the homebrewing process. While today, most of the brewers I know started out homebrewing, it’s incredible to think that many of the people who started craft breweries prior to 1978 had never brewed on their own before. I want to reiterate how invested the instructors are to the success of their students. Ben said that he would show up Stone Brewery on Thursday night to talk about beer and answer any questions that we might have over a pint. It wasn’t a requirement, but several of us took advantage of it and learned a lot. For example, I knew that India Pale Ales (IPAs) were named such because they were over-hopped English beers that were brewed specifically to survive the six-month journey to India. That said, you’ll find most fans of craft beer today will tell you that IPAs should be enjoyed as fresh as possible. Stone Brewery even has an IPA they have named “Enjoy By” to make sure that you are drinking it fresh. While talking about beer at Stone, I learned that IPAs can be aged and some should be aged. Given the history of the beer, I was shocked that I hadn’t considered that before. It turns out that IPAs with an ABV over 8% that use bittering hops (as opposed to aroma-type hops) will provide a uniquely, desirable flavor profile after aging for 6-12 months. Next week, we start Module 2 – Introduction to Brewing Terminology. I’ll write more about that class next week. Cheers! I’ve been a fan of beer ever since my good friend, Jason Harris, introduced me to “good beer” back in 2004. I’ve learned a lot about beer on my own and would consider myself more knowledgeable on the subject than most, but recently I’ve wanted to take the next step learning more about the finer points of brewing craft beer at a brewery level. When doing research on my options, I came across the University of Richmond School of Professional & Continuing Studies (SPCS) Beer Brewer Professional Certificate Program. What impressed me the most about this program was the breweries that work with the program. The list of breweries reads like a who’s who for Richmond area breweries with some great breweries just a short drive outside the Richmond Metro area. The other thing that really stuck out was that this wasn’t just a program where you were in as long as you could afford the tuition. In talking to some of my classmates on the first day, I heard that only about one in every five people that applied, were accepted into the program. My immediate reaction was that I felt humbled to be accepted into a program with such a low acceptance rate. That really spoke to the quality of the program that SPCS has put together. If they were just in it for the money, they would expand class sizes quickly to be able to take advantage of the demand. I expect that they will most likely expand in the future, but not at a rate that would compromise their ability to produce a high quality education for their students. I was very impressed with the high level of educators they had teaching the class. Over the next year or so, I’ll be chronicling my experiences in the Beer Brewers Program. I hope to be able to give a little more background on the instructors that teach in the program as well expand on some of the descriptions of what is being taught in certain modules. My goal will not be to retell word for word what we learned in class (because I could not do the experience justice as the instructors as far more knowledgeable than I am), but more share my experiences while in the program and highlight some of the things I found personally interesting. Out instructor for the history of beer is Ben Madden. Ben was the brewery at Westwood Brewery in California that won the gold medal in 1997 and the silver medal in 1998 at the Great American Beer Festival for their wee heavy (I told you these were some incredible instructors). What were the historic ingredients? What was the basic brewing process? We then worked our way through the history of beer and some key inventions that have shaped the craft beer world from 7000 B.C. through the late 1800s. What struck me the most was how a lot of the ways that beer was brewed as far back as 2000 B.C. have translated into beer styles that we still have today. Learning more about beer styles and how/when they came about is a big part of why I wanted to get my beer brewers certificate. And as with any education, there is homework. But unlike most education, this homework is fun a interesting. This week we have to do a small report (250 words) on a major influence in the word of craft beer. We were assigned names, but the instructor switched a few names around based on the interests on the students in the class. (For example one of the students plans to open up own cidery so he got the name of a brewer who also own a cidery). I got Steve Hindy. I haven’t finished my report yet, but I’ll add it as a response to this post later. If you have any questions about the program, please feel free to ask questions and I’ll answer them as I have time. I can tell you that so far, I am very excited about continuing my beer education and really believe that I made the right decision in choosing to do that at SPCS. So we all know that April 7th is the celebration of when beer became legal again in the United States after the Cullen-Harrison Act was signed into law by President Franklin Roosevelt on March 23, 1933. That law was enacted on April 7th allowing the brewing and sale of beer in the United States again as long as it was < 3.2% (4% ABV). It's said that people waited in line overnight on April 6th outside Milwaukee breweries in order to legally buy beer for the first time in over 13 years. 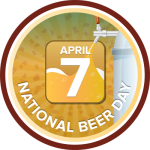 April 7th is a very beer specific celebration since prohibition did not officially end until December 5th later that year. 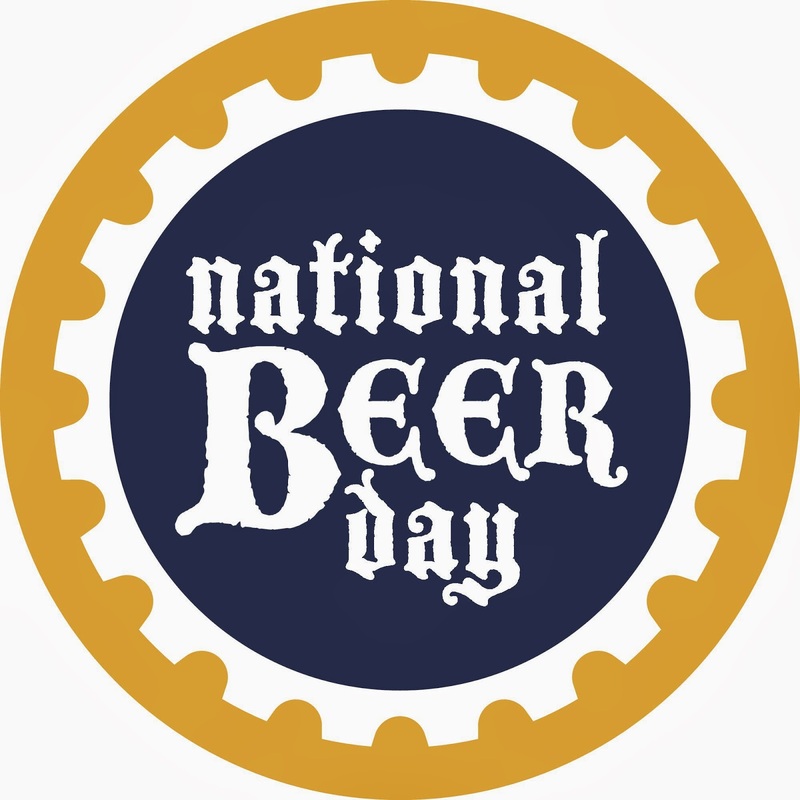 We all know that......but when was the holiday created, and when did we start to celebrate it every year as National Beer Day? It all started, when back in 2009, someone wished me a "happy National Beer Day" on March 1st. Thanks to my friend, Jason Harris, I had grown into a huge fan of beer (another story for another blog post), and later that night did some searching on the Internet to find out what important event in American history occurred on March 1st to warrant it being celebrated as "National Beer Day". Come to find out, it was an Icelandic holiday. Now, I'm not one to begrudge anyone a reason to drink beer, even if it is another country's holiday. After all, we celebrate Cinco de Mayo and St. Patrick's Day, so why not the National Beer Day of Iceland? After mentioning the new found reason to celebrate beer to my friends, it was suggested that America should have a National Beer Day too. I brushed the idea off as silly, as I am opposed to just randomly creating a day and calling it a holiday. We have enough random, meaningless holidays out there just because someone loves, let's say, bacon, and decides that their birthday should be celebrated as National Bacon Day every year. Holidays should carry some meaning. We celebrate July 4th to celebrate our independence from Britain and the birth of our nation. We celebrate January 1st as the start of the New Year and the future that the new year holds. We celebrate Thanksgiving as a time to remember to thank God for friends and family and the blessings that He has given us. There are significant reasons why we celebrate these days every year. There is a deep rooted history that is attached to these dates every year. I did not want to cheapen beer by just picking a random date. But one of my friends, Mike Connolly, would not let the idea go. He kept on pressing for the idea of an American National Beer Day. Interestingly enough, Mike was not even American. He is in fact from England and was visiting for a few months, but still refused to let the idea go. I finally told him that I would do some research into American history and see if there was a date that was worth calling National Beer Day. I figured that the Icelandic holiday celebrated their end of prohibition, so there might be something there in our history as well worth celebrating. I was still not convinced that there would be such a date because in my mind, if there were a reason to celebrate beer, it would already be celebrated, but after some brief searching on the Internet, I found April 7th and the Cullen-Harrison Act. There had to be a reason why we weren't celebrating this great day in history! After all, Aptil 7th is the date we should celebrate the ability to drink beer the other 364 days a year! After telling Mike what I had found about about a viable day for an American National Beer Day, we decided to start a facebook group. Using social media a a free means of letting others know about the glorious new holiday, we simply just invited our friends and posted on many of the other beer related groups already on facebook. From that simple facebook group, National Beer Day was born. Some Internet news sites and beer blogs picked up on the facebook group and it just blew up from there. It's impossible to fathom that a mere 77 years ago a person couldn't legally drink beer in this country. But for 13 years - from the moment "The Great (Failed) Experiment" was enacted on January 16, 1920 through 1933 - that was precisely the case. Although the actual repeal of Prohibition occurred on December 5 of that year, beer drinkers got a reprieve a full eight months beforehand. On April 7 then President Franklin D. Roosevelt repealed the Volstead Act (aka the National Prohibition Act), legalizing 3.2% alcohol by weight beer. In the first 24-hours after Roosevelt signed on the dotted line over 1.5 million barrels of beer were consumed. The country was thirsty... for beer! Over the years there have been a few - rather failed - attempts at recognizing April 7 as the historic day it is. And not just because it ironically happens to also be my day of birth. In 2003 the Brewers' Association (then known as the Brewers' Association of America) announced a national promotion called New Beer's Eve. "People need to be reminded of the single biggest cause of brewery closure," said Daniel Bradford, who was the President of the BAA then (he's now the publisher of the prestigious All About Beer magazine). "Prohibition lead to the demise of thousands of breweries and the creation of a violent criminal element. We need to remember this travesty, because it could happen again." While truer words were never spoken, this campaign never really took off. In 2008 there was a big deal made about 75 Years of Beer, complete with "Celebrate April 7th" posters, but then that got morphed into a "Celebrate December 5th" thing instead, which made it all confusing. A few weeks ago I found something on the new CraftBeer.com website called Brew Years Eve. Personally, I'm not a big fan of that name. It's too kitschy and doesn't really impart the significance of the day. We've decided that we need a day to celebrate the awesomeness that is beer. In 1933 during the prohibition era, the Cullen-Harrison Act was signed into law by President Franklin Roosevelt on March 23rd. That law was enacted on April 7th allowing the brewing and sale of beer in the United States again as long as it was < 3.2% (4% ABV). It's said that people waited in line overnight on April 6th outside Milwaukee breweries in order to legally buy beer for the first time in over 13 years. Henceforth April 7th will be known as National Beer Day and April 6th will be called New Beers Eve. So this April, tell all your friends about this glorious new holiday, and raise a glass, bottle, can, or mug to the deliciousness that is beer. I couldn't have said it any better. Click on over to the Facebook page, become a fan, and let's all put our support into making this a big deal. And if you're a lover of the liquid gold, at some point today be sure to raise a pint in remembrance of this beery special day. You can even get a beer badge from Untappd every year on April 7th by posting your beer.